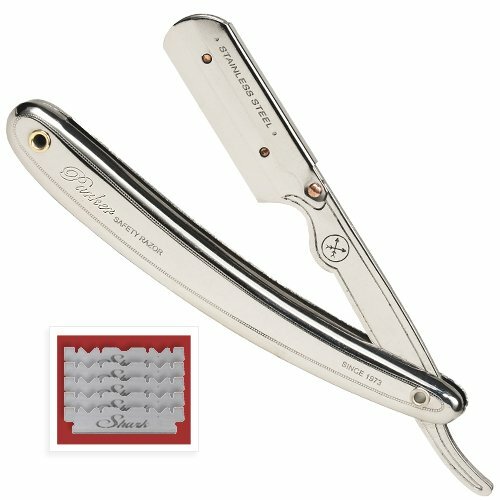 Straightrazors, also known as shavettes, have become a little sophisticated. These tools were simple and straightforward, but today they are offered with attachments and upscale technology, making them more efficient and easy to use. While you might want to go for an electric razor, there is no problem with shaving the classic way. Razors, while not as precise as electric razors, offer quality results especially when you need a close shave. A shavette has a number of advantages compared to electric razors. First off, they are cheap; when you choose a good shavette, sharpening strop, and a good shave soap, you are good to go. The razors are environmentally friendly and last long. These razors can be used in any condition. Therefore, where the machines are not available, choose a good razor and run with it. 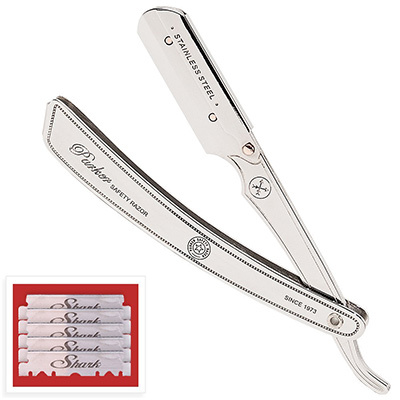 Whatever reasons you have for going classic, you will find a good shavette. When choosing a shavette, consider the material, the size, the attachment, the ease of use, especially the handles, and the value for money. If you are unsure where to start, here are our recommendations for best shavettes. The Equinox Professional Straight Razor is created from high quality stainless steel. This ensures that the blade does not tarnish and does not rust with use. The unit features a blade guard that is easy to open, making it easy to change the blades safely and without much hassle. The razors sport an ergonomic design. According to the manufacturer, Equinox International, the unit was created with comfort and durability in mind. When held at the right angle, the unit feels comfortable during use. 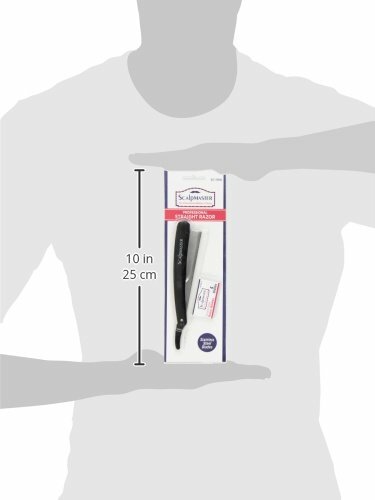 This unit is offered with 100 single-edge blades, each well-wrapped for hygiene. You can use each blade for two or three times. This gives you two hundred or more shaves. This ensures that the unit offers great value for money. 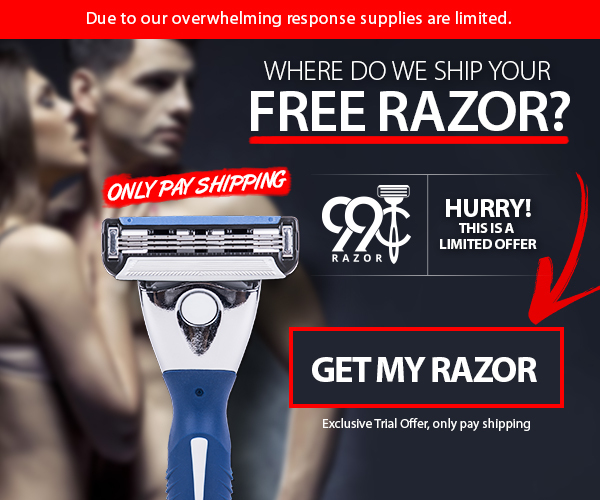 The manufacturer lets you try out the razor for thirty days after which you can return it if you are not happy with it. There are seven sizes to choose from each with a different finish and a different price. 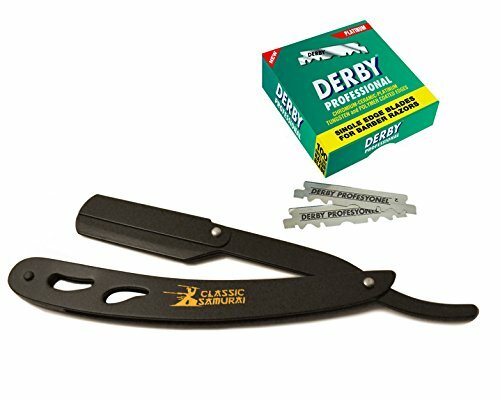 The Classic Samurai shavette was created with a beginner in mind. It sports a matte black finish that keeps it rust and corrosion resistant. Even better, the unit does not easily scratch or tarnish. Each unit is made of medical grade stainless steel. This makes it an ideal unit for home use and for professional use. The razor easily folds and is easy to replace the blades. When folded, the unit stays covered, protecting it from elements that might cause rusting. The shavette is made with exchangeable grade technology, ensuring that you remove old and rusty blades with fresh ones with ease. To let you shave for a long time, the unit is offered with 100 single-edge Derby blades. The blades are wax-paper wrapped. The whole razor is offered with a plastic pouch, keeping it safe and enhancing its durability. There are five different colors including black, silver, silver light gray, silver metal pattern and silver metal gift set. The Utopia Care Straight Edge Razor is manufactured with an easy design with rounded edges, making it safe and secure to shave with. Its smooth grip ensures that you remove overgrown facial hair. You will only need to rest three fingers on the handle and you are good to go. Each unit is made of 430-grade stainless steel, which is rust and corrosion resistant. 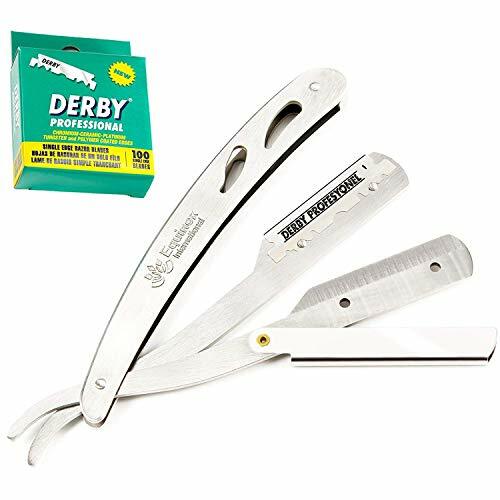 You are offered a pack of 100 single-side Derby blades for use with this shavette. To use the razor, rest three fingers on the back of the blade. The pink finger should be rested on the blade’s tank and apply slight pressure, then place your thumb on the blade’s side close to the center. The unit is offered with multiple attachments, making it versatile. Park Safety Razor has been in the industry for more than 40 years, providing high quality shaving gear and grooming accessories. The razors are beautifully and ergonomically designed, ensuring that the shaver can change the shaving blades with ease. 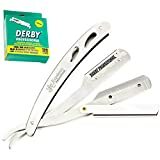 It features a clip to close mechanism, securing the razor and keeping it away from elements that can trigger rust and cause scratches. The unit is created with high quality stainless steel. You can use it for heavy duty shaving such as in professional settings. Each unit weighs about 2.3 ounces. The rounded edges ensure that you stay free of cuts and nicks when shaving. You are offered five half double edged blades. The Diamond Edge Professional Shavette is a budget shavette designed for those who need to start shaving immediately. It is a simple straight razor made of 100 percent stainless blade. This enhances its durability; each unit is rust and corrosion resistant. The unit comes with five double-edged blades. You can cut the blades in half and use them for 10 replacements. The silver straight razor folds and unfolds with ease. When folded, the blade is covered, keeping it safe and allowing the blades to be used at least twice. The smooth handle of the razor enhances grip, making the unit comfortable to use. During use, the unit feels sturdy, and can be used professionally or at home. Either way, it gives a close shave. While straight razors are not as common as they used to be, they are still great units to use when you need a clean and smooth shave. In fact, if you are always shaving smooth and have no need for trimming your hair, you should choose a good shavette. The units are easy to use when you get used to them. More so, when you need to shape your hair or sideburns. Shaping, however, needs a professional barber. 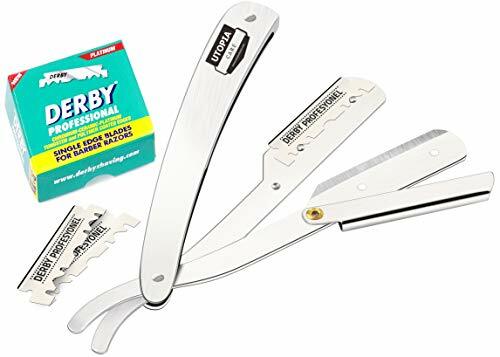 These straight razors are recommended for personal use at home and for professional barbers.